There are a wide variety of activities available for individuals, groups and families of all ages and abilities staying at Lea Green or in our purpose built accommodation for people with additional needs – Meadow Lodge. Some activities are based within the Lea Green site near Matlock and some take place in the surrounding countryside. Lea Green has a ‘challenge by choice’ ethos with an emphasis on children and young adults pushing their personal limits. Activities have varying options based on age, ability and confidence levels. * These activities are suitable for year 4 and above. We also have links with local horse riding, windsurfing, rafting and sailing facilities and are happy to arrange these as part of your visit. As well as adventurous outdoor activities, we have plenty of traditional (and not so traditional) sports. Lea Green has national prominence as one of the country’s first dedicated sports training centres. In 1964 it hosted the England Football Squad for their training camp as they began preparations for the 1966 World Cup. The enthusiasm and commitment to sporting excellence and sport for all is something that carries on today. A wide range of National, Regional, County and local sports organisations use Lea Green for training camps, events, races and development days. These sports range from football, rugby, karate, badminton, basketball and wheelchair basketball, through to X-country running, fell races, fun runs and less well known sports including lacrosse, cyclo-cross and boccia. 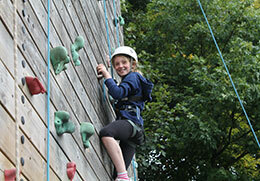 Whatever your sport, Lea Green provides a well-resourced training and event venue for camps or sport days. We welcome five-a-side football teams, badminton and gymnastic clubs and cyclo-cross cyclists on a weekly basis, as well as local schools for their sports galas and national karate associations for their annual training camps. Click here to book sports facilities.